Most Say It’s Because They’re Not Planning to Leave Soon ~ A recent news release submitted by our sponsor Robert Half. Change management is always a major concern for organizations, but few challenges are more disruptive than an executive departure. In a new survey from Robert Half Management Resources, only 52 percent of CFOs said they have identified a successor for their position. The research suggests small businesses (20-49 employees), in particular, may be less prepared to deal with potential leadership changes, with only 37 percent of financial executives at those companies citing they have an heir apparent. Of the respondents without a succession plan, 64 percent said it was because they were not planning to leave the company in the near future. Other reasons included a lack of qualified candidates within their current organization (17 percent), focus on other priorities (14 percent) and lack of concern as the executives would no longer be with the company (4 percent). 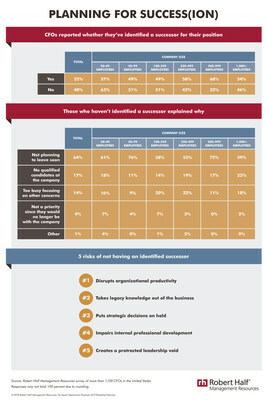 View the Planning for Success(ion) infographic, which includes the survey results by company size and highlights five risks of not having an identified successor, at roberthalf.com/blog/management-tips/planning-for-succession. “Succession plans are critical but often overlooked as executives focus on other pressing issues,” said Tim Hird, executive director of Robert Half Management Resources. “Yet for a business to weather change and continue to run smoothly, it’s imperative to identify and train potential successors, not just for C-level positions, but roles throughout the organization. Legacy loss — A company that doesn’t engage in executive mentoring and knowledge-sharing can struggle with retention and potentially lose institutional expertise. Protracted leadership void — Companies faced with an unplanned departure frequently appoint an interim leader to fill the gap while a search is conducted, but it’s prudent for executives to anticipate such circumstances to ensure a smooth transition and graceful exit from the role. The online survey was developed by Robert Half Management Resources and conducted by an independent research firm. It is based on responses from more than 1,100 CFOs at U.S. companies with 20 or more employees. Robert Half Management Resources is the premier provider of senior-level finance, accounting and business systems professionals for companies’ project and interim staffing needs. Customizing its approach for each organization, Robert Half Management Resources can provide a single consultant, a financial team or full-service consulting services, delivered through Protiviti, a Robert Half subsidiary. With 135 locations worldwide, Robert Half Management Resources works with companies of all sizes, including more than half of the top 100 companies from the FORTUNE 500®. For more information, visit roberthalf.com/management-resources.